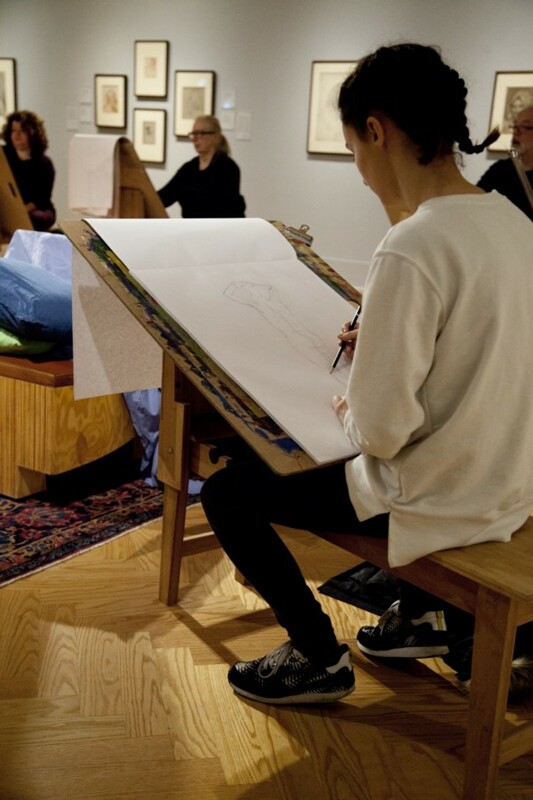 This winter, you can take a series of instructor-led life drawing classes inside the exhibition Drawing, Je t’aime: Selections from the AGO Vaults. 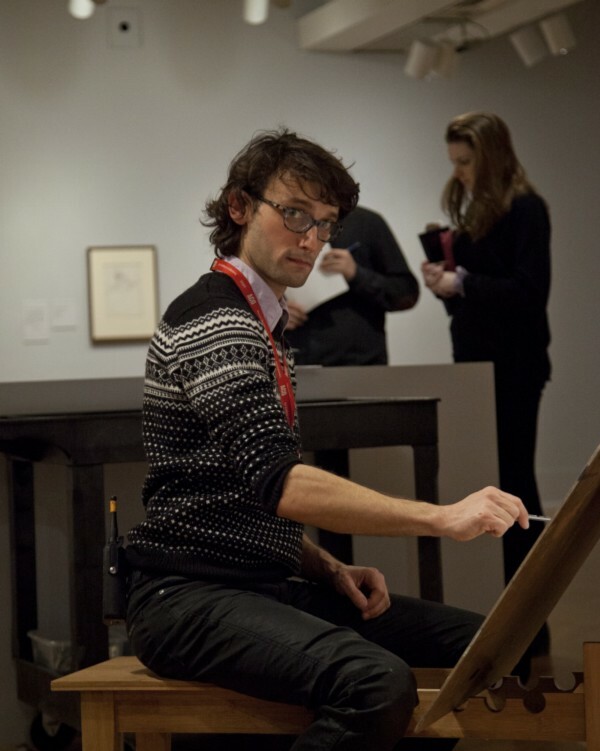 Course instructor and artist Bogdan Luca gave the AGO’s Online Media officer, Amanda Hadi, the low-down on why anyone can and should want to draw, and why the pencil always trumps the camera as a travelling tool. Want to register for the next class? Click here. What does the word “drawing” mean for most people? I think it can be intimidating… Some people find it mystical and incomprehensible. It goes along with this idea of genius — that only certain special people can and know how to draw. “You’re born with a pencil in your hand.” When in fact, I believe anyone and everyone can draw. If you can write by hand, you also have the ability to draw. It’s just a matter of rearranging those scribbles in other configurations. So your workshop is very inclusive — anyone of any skill level or experience can sign up, even people who haven’t picked up a pencil before. What’s your advice for someone who’s attempting life drawing for the first time, or someone who hasn’t drawn in a group setting? I would say the best advice is “Don’t be too hard on yourself. Learn and have fun.” The workshop is held in one of the gallery rooms of the exhibition Drawing, Je t’aime. You’re immediately surrounded by all of these masterful drawings. So people might look at those works and say “Okay, that’s what drawings are supposed to be! That’s what they’re supposed to look like!” And they might feel like they need to achieve that level of perfection. But you should not have that expectation; you should be able to look at those drawings and see what you can learn from them, how the artist was looking at the world in such a way that they could draw it. 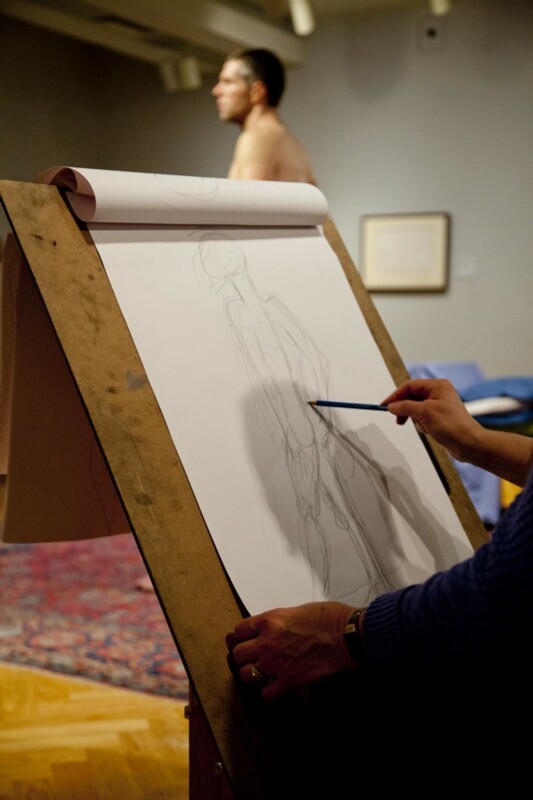 Why is it important to study life drawing, or draw from a model? Is it just to learn the basics of the human figure, in motion or in stillness? It’s helpful because if you want to do figural drawings, you need to develop your speed; you have to learn how to draw quickly. Drawing from life models is great practice for that. You start to learn what you need to look for — certain proportions, a certain rhythm of angles and curves, or some overall sweeping lines that can describe very quickly what a subject is doing. You also learn how to draw an energy or a movement or an activity in a very few lines. And that can form the basis for drawings that are more expressive of life. Is drawing an exercise for thinking? Definitely. Drawing is much more than a medium: it’s actually a way of thinking, and it’s very direct. It’s thinking through images, trying to solve a puzzle, or trying to construct something that you’re seeing. You’ll notice the best painters and sculptors in history were all amazing draughtsmen. I love to look at those artist sketches: you can see them trying to figure out the scene; changing things, projecting things. What’s the best thing about drawing, that makes it so appealing as a pastime? Drawing is such a great activity because it’s so low maintenance. As soon as an idea hits, you can draw anywhere, even on a napkin. Or if you see something interesting, even here in Walker Court, you can document it. That’s funny — my first impulse, when I see something spectacular, is to take a photo on my phone. I find drawing is a good way to help you to look at what’s around you — more so than taking a photo. That’s why I always draw when I’m travelling, I don’t take photos. Things that I’ve drawn when I’m travelling, I remember those scenes and subjects more than I would have if I’d just snapped a photo. When you’re drawing, you’re focused. You have to be more involved with what you’re looking at; you see more details. When you’re drawing, you remember the experience of being there. Is there an important tool to have in your travel kit or toolbelt (a sketchbook, a certain pen)? The problem having a certain or favourite pen/sketchbook/whatever tool that you need to sketch is that, when you don’t have that special item, you suddenly have an excuse not to draw. And it holds a lot of pressure and expectation; if it’s a special sketchbook, there’s that expectation built into it. You open it up and you think you must do something incredible to warrant the use. It must depend on your personality. For me, not having the right tools shouldn’t be your obstacle. A pen, a pencil, a napkin, anything will do. I like to travel with very little, and grab drawing tools on the way. Turning the tables: what’s the best advice you got from an instructor or an artist? Someone told me not to have high or unrealistic expectations of how my work is supposed to look; or how a finished piece should look. They said “We all have 10,000 terrible drawings in us, and the sooner we get them out, the better!” It’s just like with any practice; you have to put in the time. Final push! Tell us something your students will get out of this workshop. I think people might want to take this course, not because they want to become esteemed, high artists but because in trying it for themselves, it might give them insight into looking at some of this art. To have a more intimate understanding of what drawing means, as an activity and as an art form.